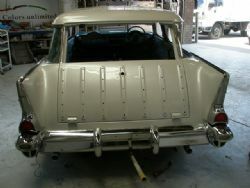 It was a pleasure to go out to Joscar and see the Nomad being built by Joe and Brian. 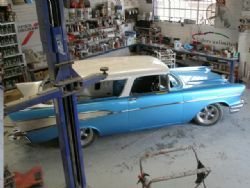 As I walked into the workshop my initial reaction was wow and it got better from there. The paint is complete and since I saw it last the entire rear of the car has been sprayed to match the roof and it looks sensational. 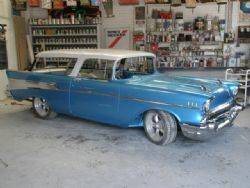 The paint has been cut and buffed to a superb finish and although the car was covered in dust from the shop blind Freddy could see it was a top shelf job. The entire front end has been reassembled and all the bright work has been installed for the last time. New bumpers, grille bar, hood bar, rockets, grille and headlight bezels really make it pop. The contrast of chrome against the blue just finishes it perfectly and given all the parts are reproductions the alignment and gaps are spot on. This is normally something that requires a great deal of massaging and Brian was amazed at how they mated up to give clean, straight lines. All the exterior mouldings that were painstakingly restored by Moulding Repairs and Polishing are now being installed on the car. 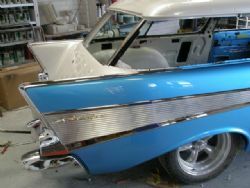 Both sides have been done and the addition of new quarter panel inserts really highlights the rear fins. The window surrounds on the left hand side have been installed and the first piece of glass on the left rear quarter is now in its final resting place. Parts of the dash are in and the rear bumpers were being installed while I was there. The rear top fin mouldings are on as are the rear tail lights and vertical fin trim. The radiator, fittings and overflow bottle have been reinstalled so it looks as good under the bonnet as it does outside. As with most things Murphies Law comes into play. They have had a couple of days were everything goes right followed by a day were it takes hours to install and align a piece that should take minutes. It has also come to light that I missed a few things when ordering parts for the car and a number of small window related parts have just been ordered and two bumper brackets that I never had on the car when I purchased it.